Bunions (hallux valgus) are described as a bump on the side of the big toe. But a bunion pain is more than that. The visible bump actually reflects changes in the bony framework of the front part of the foot. With a bunion, the big toe leans toward the second toe, rather than pointing straight ahead. This throws the bones out of alignment, producing the bunion’s “bump.” Bunions are a progressive disorder. They begin with a leaning of the big toe, gradually changing the angle of the bones over the years and slowly producing the characteristic bump, which continues to become increasingly prominent. 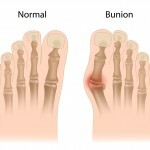 Usually the symptoms of bunions appear at later stages, although some people never have symptoms. Dr. Dennis Timko is a St. Louis Podiatrist that can help figure out if your bunion is needing foot surgery or can be corrected conservatively. 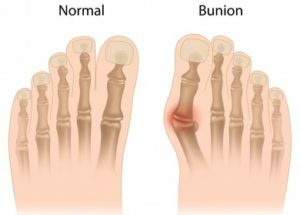 What Causes a painful Bunion? Bunions are readily apparent–you can see the prominence at the base of the big toe or side of the foot. However, to fully evaluate your condition, the foot and ankle surgeon may take x-rays to determine the degree of the deformity and assess the changes that have occurred. Because bunions are progressive, they don’t go away, and will usually get worse over time. But not all cases are alike some bunions progress more rapidly than others. Once your foot and ankle surgeon has evaluated your particular case, a treatment plan can be developed that is suited to your needs. Padding. Pads placed over the area of the bunion can help minimize pain. You can get bunion pads from your foot and ankle surgeon or purchase them at a drug store. Medications. Nonsteroidal anti-inflammatory drugs (NSAIDs), such as ibuprofen, may help to relieve pain. When the pain of a bunion interferes with daily activities, it’s time to discuss surgical options with your foot and ankle surgeon. 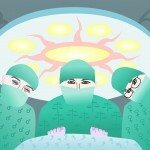 Together you can decide if surgery is best for you. Most of the time conservative treatment does not help alleviate bunion pain or the deformity. Recent advances in surgical techniques have led to a very high success rate in treating bunions. A variety of surgical procedures are performed to treat bunions. One type of surgery is called a SCARF procedure. The procedures are designed to remove the “bump” of bone, correct the changes in the bony structure of the foot, as well as correct soft tissue changes that may also have occurred. The goal of these corrections is the elimination of pain. In selecting the procedure or combination of procedures for your particular case, the surgeon will take into consideration the extent of your deformity based on the x-ray findings, your age, your activity level, and other factors. The length of the recovery period will vary, depending on the procedure or procedures performed. Most typical bunionectomy procedures will need about 4-6 weeks off work or light duties then additional 2-4 weeks for complete healing. Some swelling will continue with some patients for up to 1 year duration. Typical bunionectomy procedure will require a walking cast boot for 4-6 weeks then switch to a surgical shoe to complete 8 weeks. Physical therapy may be ordered to decrease swelling and stiffness after surgery. For more complicated bunions that need additional procedures, patients may require 8 weeks in a short leg cast with crutches for complete recovery. This will be decided by your podiatrist after full evaluation with X-rays are performed. The length of the recovery period will vary, depending on the procedure or procedures performed. Coming soon: Click here to see a timeline of what to expect from a typical bunionectomy procedure and the time it takes from pre-operative to post-operative and full recovery.